CROSBY-The Crosby Cougars kept their playoff aspirations alive Friday night with a 42-20 Homecoming win over the Galena Park Yellow Jackets. With a 3-1 district record, Crosby is now tied with two other teams for second place in district with the top three teams advancing to the postseason. The Cougars were a juggernaut against Galena Park, racking up 512 yards of offense. Durran Stark put the Cougars on the board in the first quarter with a 17-yard touchdown run. He rushed for 74 yards on six carries in the game. Midway through the first quarter Chance Casey made it a 14-0 game with a two-yard run. Casey led the Cougars with 148 yards rushing on 15 carries. Stark showed that he could throw as well as run in the second quarter with a 39-yard TD strike to Caleb Randolph. He went 10 for 20 for 223 yards on the night, while Randolph had 67 yards receiving. Two minutes later Galena Park got as close as they would for the night with touchdown pass. Casey would increase the Crosby lead to 21-6 with 5:25 left in the second on a one yard run. With just over a minute to go in the first half, Jesse Moore scored on a 50-yard pass from Stark. Moore had 95 yards on four catches. This gave Crosby a 35-6 halftime lead. The Cougars would score once more in the game, when Casey ran the ball in from the five-yard line in the third. The Yellow Jackets put up two touchdowns in the fourth quarter. The first came on a 55-yard fumble recovery and the other on a running play. While the offense put points on the board, the Cougar defense kept Galena Park off-balance with turnovers. Crosby forced one turnover on a fumble while Alvin Baptise and Ryan Weatfall each had an interception. Cougars Head Coach Kevin Flanigan said that he was proud of the way his team performed Friday. Usually with the events that surround Homecoming players tend to get distracted, he said, but the team really showed their focus. The Cougars will travel to Forest Brook this week. The Jaguars are coming off a loss to Hargrave last week. Harris County Commissioner Sylvia Garcia unveiled an ambitious plan for 26 historical sites to be developed in Precinct 2, at a meeting held last week for the local media. She explained that the idea for an Historical District, to act as a tourist attraction and a new economic tool, grew out of conferences she held in September 2003 to study and improve the quality of life in her Precinct 2. While she is working with industry to improve appearances and air quality, at the same time she wants to change the image of the area from industrial to emphasize it?s national importance as the birthplace of democracy. 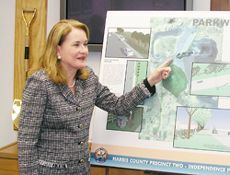 She has teamed with the Economic Alliance Houston Port Region and 15 municipalities, the Port of Houston, and the City of Houston that are part of that alliance, to build and maintain these sites. Each area will get to say what is important to their history, and develop the sites to their own specifications, said Jan Lawlor, President/CEO of the Alliance. As presented to the press, the project will encompass 26 sites through the southeast portion of Precinct 2. However, one of the main features will be the development of Battleground Road, past the San Jacinto monument, into a new ?Independence Parkway?. The northern terminus of this parkway will be the I-10/Crosby-Lynchburg Road intersection. It will be marked with four high pylons, topped with single stars. This same design will be used at the other sites, to integrate and mark the project. Included in the development, and set to break ground in the near future, will be the redevelopment of David G. Burnet Park in Lynchburg. Burnet was the first president of the Texas Republic. A replica of his house will be constructed on the site where it stood in the park. Garcia said that she has raised some of the money for the project, which will be funded mostly by private donations and grants, with some funds coming from her Parks budget. She has applied for state grants for the first three sites to be developed, which are a gateway park in Harrisburg, the Independence Parkway, and new ?roundabouts? at the ends of the Washburn Tunnel. As part of the Stars project, Garcia plans on a complete renovation and update of the tunnel. It is over 50 years old, built in 1950, she said, and many of the systems need replaced. Many of these sites are intended to be teaching areas for children, as well as tourist attractions. Another feature of the designs will be huge ?Epic Art? photomurals on the sides of oil storage tanks along Routes 225 and 134 in Pasadena and Deer Park. These will depict the battle of San Jacinto, as families drive to the battlefield. Garcia said that two new ferries are still part of the overall Master Plan, but the actual contract for these ships has been delayed until market conditions dictate a favorable bid price. New signage at the Stars sites will help visitors understand the importance of the area, and the steps in the historical march to independence. To help pay for this project, Garcia held a benefit gala last month along with the Alliance. Guests who normally contribute to her political campaign were invited to fund the Stars Project instead. Over $500,000 was raised at the banquet, which included a good natured roast of Garcia. Guests at the gala included former mayors Kathy Whitmire and Bob Lanier and many other well known figures. She was honored for her 20 years in public service, and the event was a sellout at the downtown Hyatt Regency hotel. Another feature of the plans is to restore the Lynchburg cemetery, and to get it historical designation by the state. Garcia has personally investigated the cemetery site, which she said is in disrepair, partially underwater, and has only 5 intact headstones that can be seen, although it is thought by historians to hold over 100 bodies. Garcia will be honored again this week, when she is awarded the Visionary Award at a Banquet in Houston. HIGHLANDS Poise, presentation and the ability to think on ones feet. These are among the attributes for the teenager who is selected to represent the community as Miss Highlands. Megan Lee demonstrated these abilities and more Saturday as she beat out a field of 13 to win the coveted Miss Highlands title. The pageant, hosted by the Highlands Horizons, has been held every year (except 1957) as part of the Highlands Jamboree celebration. The competition began Saturday morning as contestants were judged as they rode in parade. Later that evening a near-capacity crowd gathered at the Highlands Junior School auditorium for the pageant. Featuring a show tunes theme, the pageant began with the contestants in a dance number to  Lady Marmalade from the musical Moulin Rouge. The opening number, which was choreographed by Brittany Dew and Tristanna Ford, was also part of the competition in which each girl receiving points that would be used as a tiebreaker. This years master of ceremonies was Sterling-White Funeral Home General Manager David Pena, who was assisted by 2005 Miss Highlands Whitney Bell. Saturdays competition consisted as three parts: sportswear, evening gown and interview. The sportswear and evening gown sections were judged on modeling and appearance while the interview tested the contestants ability to think on their feet. Regarded by many contestants as the hardest part of the event, each candidate is given the same question that is kept secret until they are on stage. The other contestants are kept backstage where they can hear neither the question nor the response. This years question was What is the best advice you could give to a freshman entering high school. While many suggested that freshmen be themselves and to concentrate hard on their studies, a couple warned freshmen not to buy elevator passes, listen to seniors or look for the third floor gymnasium. One popular part of the pageant, which was scored for a separate award and did not figure into the Miss Highland title, was talent. During a mother-daughter tea before the pageant, each girl had her picture taken. A three-judge panel reviewed these photos and Courtney Briscoe was name Most Photogenic. Another award presented was the Congeniality Award. This award is considered a special honor in that it is voted on by the other contestants. Ashley Hicks won this years award. Miranda Martin was recognized as the contestant who pre-sold the most ticket to the pageant. Jennie Robbins was known throughout Highlands for her dedication to the community. After her passing, the Highlands Horizons created the Jennie Robbins Community Service Award to honor her memory and to recognize the contestant who exemplified Robbins example. ]Robbins daughter, Kathryn Dunlop, presented the award to three girls this year: Candace Smith, Hicks and Briscoe. In the final judging, Briscoe was named second runner-up while Rachel Bailey won first runner-up. Earlier in the day, the 14th Annual Junior Miss Highlands Pageant was held. With competition similar to the older girls, the junior high-aged contestants were judged on sportswear, party dress and interview. The girls interview question was If you could be invisible for one day, what would you want to do. Most of the girls would use the power to learn who was talking behind their backs, what boys really say about girls and to play tricks on friends and siblings. Faith Drews won the talent award for her performance of Somewhere Over the Rainbow. Shelbi Wallace won Congeniality and high ticket sales while Lexi Edwards took the photogenic award. Madison White was named Junior Miss Highlands. Emilee Traylor won first runner-up and LaKeisha Mitchell won second runner-up. 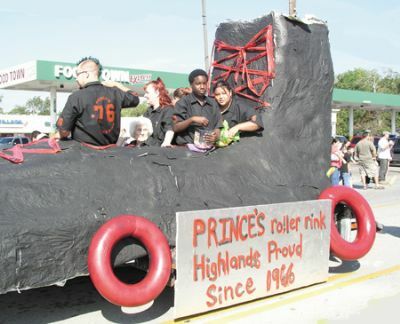 HIGHLANDS Thousands lined Main Street to view the parade, attend the Miss Highlands Pageants, view the crafts booths, run in the Fun Run, and dance the night away at the street Jam. Last weekend was the 50th Highlands Jamboree, and great weather and a well organized event contributed to large crowds and a good time for everyone involved. Jamboree organizers included Margie Elliott, Betty Brewer, Ramona Hanagrif, Brandi Tapley, Tonya Russell, Jessica Woods, and scores of volunteers that helped. The theme of the event was Highlands Proud, and many of the floats in the parade used this motto on their floats. TOP PRIZE, for BEST THEME: Princes Roller Rink. Tie 3 ways, with Brad Ball, Ronnie Mekalip, and Chance Mekalip. 1. Magnavox TV/DVD, Phillip Morris; 2. Laptop Computer, Teddy Matocha; 3. Diamond Bracelet, Paul Pickynski; 4. Afghan, Susan Hotchkiss; and 5. Dual DVD Player, Jesus Zarate. 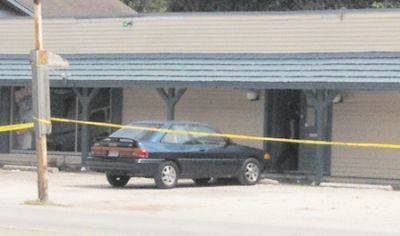 HIGHLANDS  A woman employee of the Green Room arcade shot herself and a robbery suspect at an alleged eight-liner arcade early Monday morning. On October 9 at about 4:58 a.m., calls went out for ambulance service to 509 North Main. At 5:12 when they arrived, medics immediately called for Lifeflight helicopters for a robbery suspect, and transported an unnamed female employee to Hermann Hospital by ambulance. Circumstances are sketchy but witnesses agree it happened pretty quick. Just after 4:30 a.m. two men entered the Green Room Game Room. Two suspects set about robbing the arcade after a few minutes of apparently casing the surroundings. One, detectives say, started robbing a male customer of his wallet with the added touch of striking him on the head, another threw a female clerk on a table. That clerk pulled a .32 caliber pistol and while struggling with a suspect shot herself in the elbow. Next, she shot Tomma Hiawatha Waid in the upper thigh. The suspect that had thrown the clerk onto the table fled the scene on foot. The escaping suspect has much to worry about since deputies have information on him. He is described as a black male, 5 feet 8 inches in height and weighing about 180 to 200 pounds. The bullet fired into the other suspect apparently severed the femoral artery in his thigh. Waid was said to have required C.P.R. on the helicopter and in the Hermann Hospital Emergency Room but did not recover from surgery, and was pronounced dead. Harris County Sheriffs Deputies indicate lots of reasons not to play the local arcades, most of which have to do with limited security. Then there are laws prohibiting gambling in Texas. According to robbery Sergeant Pair, another recent robbery of an arcade in Harris County resulted in an armed guard being robbed of his gun and patrons also robbed. The shooting will be referred to a Grand Jury. Anyone with more information on the escaped suspect is asked to call Harris County Sheriffs Robbery Division at (713) 967-5770.